Like Han Solo? Really? | Let's Talk... About Virtual Administrators! Han was the ultimate businessman. He owned his own business, ran it lucratively and the sky was the limit, literally and figuratively. Real Estate Agents have the same potential. There are no restrictions on how much you can earn or sell. How industrious do you want to be? I know, can you believe it? Someone not like you? Unfortunately it’s true. There are those people out there who you just do not meld with for whatever reason. And it’s not personal. It usually boils down to some aspect of money. Even trusty Han Solo was considered arrogant, greedy and self-centered. A misconception on both counts that are generally not warranted because most agents are hardworking individuals with your best interests at heart. After all this is the biggest transaction you’ll probably ever make. Remember Chewbacca? How could Han operate without him? 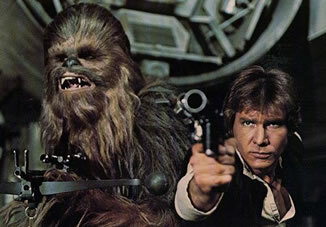 Chewy was his right hand man, well Wookiee. All in all, you agents do not work alone. You have mentors and an office of leaders to work with you. And if you’re headed for greatness, you’ll have a support staff. A virtual partner like OS4U gives you the ability to gain and close deals with a mutually beneficial relationship. This one is tricky because danger can lurk at any corner but the isolated nature of a real estate agent makes them a target. So just like Han Solo, a good blaster at your side is a must. « Renovate, Redecorate or Rejuvenate?